3D without glasses - the future of 3D technology? Today it's hard to find a person who's never heard about 3D technology. With the popularity of 3D tablets, 3D TV sets, 3D laptops and 3D smartphones on the rise it's no wonder that more and more people are getting interested in the nature of three dimensional technology. 3D vision has started with the invention of stereoscopic 3D concept and has gradually evolved to many modern methods of 3D technology. So if you can tell the difference between anaglyph red cyan, polarized and shutter 3D glasses, you definitely have a clear perception of what 3D is and how it works . Most of us associate 3D technology with the use of special glasses or virtual reality headgear to filter what image each of our eyes sees. But what do we know about 3D without glasses? Is it just a futuristic concept or already a reality? The technology of 3D without glasses is called autostereoscopy. Because this kind of three dimensional technology doesn't utilize special spectacles or headgear it became also known as glasses-less 3D or glasses free 3D. Glasses-less 3D is based on two different approaches of viewing: eye-tracking and multiple views. The eye-tracking system was first implemented in autostereoscopic 3D displays by Reinhard Boerner in 1985. Those 3D displays with eye-tracking employed provided high resolution, but were limited to a single viewer only. That's why eye-tracking approach can't be widely used for consumer products. The alternative concept is multiple views technique that has swiftly become the next best thing in the development of glasses-free 3D. This particular approach is based on sending imagery to multiple regions of viewing at once, thus enabling several viewing zones. Today this concept is implemented in the most flat panel displays, because it allows simultaneous viewing for multiple spectators. 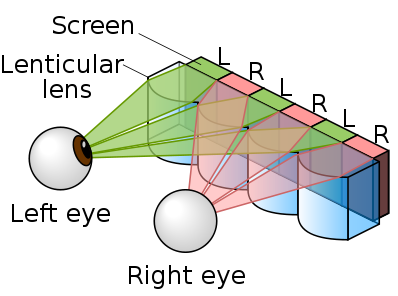 The methods of 3D technology without glasses include a parallax barrier, lenticular, volumetric and holographic techniques. This method is widely used in modern 3D liquid crystal displays. Parallax barrier is a special device with a series of precision slits that's placed in front of LCD, serving as a filter for output image perception. The slits allow left and right eye to see their corresponding image, which is produced by a different set of pixels. That's how the illusion of 3D vision is created by parallax barriers. To have a clearer understanding of this method see the image - it should help a lot. The examples of parallax barrier employed in consumer products are Nintendo 3DS game console, HTC EVO 3D and LG Optimus 3D smartphones. Also used in Range Rover's navigation system, the parallax method allows both the driver to view GPS directions and a passenger to watch movies from the same display simultaneously. However, the parallax method is not perfect, because it has some disadvantages. First one is that in order to experience stereoscopic 3D effect the viewer must be positioned at a certain angle to the display. That's actually not a big problem if we're talking about video game consoles or smartphones, but not good when it comes to 3D TV sets, laptops etc. Another con is that the count of horizontal pixels that work to create a different image for each eye is limited to one half. The second mostly used method of glasses free 3D is lenticular lens technique. You may have heard about lenticular printing that creates the illusion of depth, haven't you? If not then you should know that an autostereoscopic 3D display with lenticular lenses utilized is actually the same technique as lenticular printing. Generally speaking the lenticular method is based on the use of magnifying lenses. Those lenses are set in arrays to produce slightly different images when viewed from different angles. They are also constructed in such way that when you see the image from one angle and then move to another angle the image changes as well and even moves (see the image). The technique of lenticular lenses as a method of receiving a glasses-free 3D image is executed in iPhone and iPod touch in the form of 3DeeSlide hardware overlay. 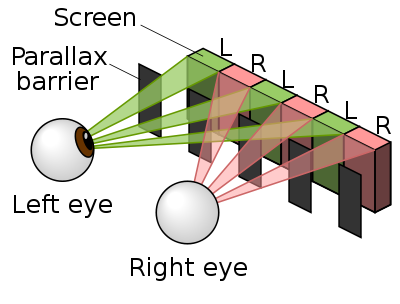 Another type of autostereoscopic 3D is a volumetric display. This method relates to the construction of three dimensional images by means of various physical mechanisms. Volumetric displays use light fields to reconstruct 3D object in the volume of space. The created 3D images are thus measured in voxels (volumetric pixels) and can be seen with the unaided eye. A good example of volumetric imaging devices are 3D displays used for tomography (see the image below). The main advantage of volumetric displays is that they allow automultiscopic (autostereoscopic multiple viewing) 3D experience. The method of holography is based on reconstructing 3D objects using light recording. A hologram is created when an interference of several electromagnetic waves with equal frequencies occurs. During a hologram recording two electromagnetic waves intersect: the main wave is emanated from the source while the second one is reflected from the object that's being recorded. A pattern of such interference leaves an imprint on some recording medium (photographic plate or other) placed in the interference area. Holography today is used in modern holographic displays with lasers being the main light source. Lasers are utilized mainly because they are powerful light beams and have a fixed wavelength. 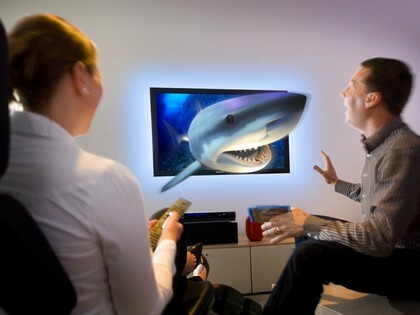 The spreading of holographic 3D displays is wide in the artistic field; usually this process is combined with music and computer graphics. 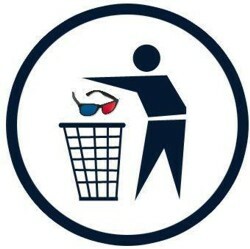 Conclusion: Is 3D without glasses really the future? With the constant development of 3D technology and the new inventions of our technological age the 3D glasses as we know them will soon become a thing of the past. So whether you are a fan of 3D or not you simply can't deny that 3D without glasses is the future of 3D vision. When it becomes a common practice and employed in the most devices all the last doubts will fall away. Do you agree? Try watching regular video in anaglyph 3D format with powerful 3D Video Converter! Put on anaglyph red-cyan 3D glasses and enjoy the converted video or movie in red cyan 3D HD. Free trial version is available to download so start your 3D experience right now! Watch any movie in red cyan 3D using awesome 3D Video Player. Download your free trial version of fantastic 3D Video Player and try it out!